Pichia pastoris is a widely-used host for recombinant protein production; expression is typically driven by methanol-inducible alcohol oxidase (AOX) promoters. Recently this system has become an important source of recombinant G protein-coupled receptors (GPCRs) for structural biology and drug discovery. The influence of diverse culture parameters (such as pH, dissolved oxygen concentration, medium composition, antifoam concentration and culture temperature) on productivity has been investigated for a wide range of recombinant proteins in P. pastoris. In contrast, the impact of the pre-induction phases on yield has not been as closely studied. In this study, we examined the pre-induction phases of P. pastoris bioreactor cultivations producing three different recombinant proteins: the GPCR, human A2a adenosine receptor (hA2aR), green fluorescent protein (GFP) and human calcitonin gene-related peptide receptor component protein (as a GFP fusion protein; hCGRP-RCP-GFP). Functional hA2aR was detected in the pre-induction phases of a 1 L bioreactor cultivation of glycerol-grown P. pastoris. In a separate experiment, a glycerol-grown P. pastoris strain secreted soluble GFP prior to methanol addition. When glucose, which has been shown to repress AOX expression, was the pre-induction carbon source, hA2aR and GFP were still produced in the pre-induction phases. Both hA2aR and GFP were also produced in methanol-free cultivations; functional protein yields were maintained or increased after depletion of the carbon source. Analysis of the pre-induction phases of 10 L pilot scale cultivations also demonstrated that pre-induction yields were at least maintained after methanol induction, even in the presence of cytotoxic concentrations of methanol. Additional bioreactor data for hCGRP-RCP-GFP and shake-flask data for GFP, horseradish peroxidase (HRP), the human tetraspanins hCD81 and CD82, and the tight-junction protein human claudin-1, demonstrated that bioreactor but not shake-flask cultivations exhibit recombinant protein production in the pre-induction phases of P. pastoris cultures. The production of recombinant hA2aR, GFP and hCGRP-RCP-GFP can be detected in bioreactor cultivations prior to methanol induction, while this is not the case for shake-flask cultivations of GFP, HRP, hCD81, hCD82 and human claudin-1. This confirms earlier suggestions of leaky expression from AOX promoters, which we report here for both glycerol- and glucose-grown cells in bioreactor cultivations. These findings suggest that the productivity of AOX-dependent bioprocesses is not solely dependent on induction by methanol. We conclude that in order to maximize total yields, pre-induction phase cultivation conditions should be optimized, and that increased specific productivity may result in decreased biomass yields. P. pastoris is a simple eukaryote with a fully sequenced genome ,, which can be cultured to high biomass yields without incurring high costs . In its most widely used format, protein production is driven by a very strong, methanol-inducible alcohol oxidase (AOX) promoter, which is generally accepted to be tightly regulated . To take full advantage of its attributes, P. pastoris must be cultured in controlled bioreactors, rather than shake-flasks, in cultivations that typically comprise several distinct phases. During the first or batch phase, cells grow at their maximum growth rate (μmax) until the initial carbon source, typically glycerol, has been depleted. In a subsequent fed-batch phase, the same carbon source is fed continuously with the objective of yielding high pre-induction biomass; during this phase, growth is nutrient limited and a constant specific growth rate, lower than μmax, is achieved. A transition phase, when the glycerol feed is stopped and the cells are monitored for glycerol depletion, allows the cells to adapt to low concentrations of inducer (typically methanol); in some cases temperature changes are also applied to facilitate induction at a temperature optimized for a given target protein. Finally, in the induction phase, methanol is added in a controlled manner , to induce AOX-driven recombinant protein production. Recently P. pastoris has become an important source of recombinant G protein-coupled receptors (GPCRs) for structural biology and drug discovery. Drugs targeting GPCRs, which transmit a wide array of signals in different cell types, underpin modern medicine ; they account for about 40% of all prescription pharmaceuticals on the market. Relevant structural results are exemplified by the X-ray crystal structure of recombinant human histamine H1 receptor bound to doxepin at 3.1 Å resolution  and the 2.7 Å resolution structure of recombinant A2a adenosine receptor (hA2aR ) in complex with an antibody Fab fragment that stabilizes an inactive form of the receptor . Numerous studies have examined the influence of parameters such as the temperature and pH of the culture, the amount of dissolved oxygen (DO) in the culture medium and, specifically, the addition of chemical additives and ligands for optimal GPCR production in the pre-induction and induction phases of P. pastoris cultivations ,–. Notably, Singh and colleagues observed active hA2aR in bioreactor cultures prior to the methanol feed , while this was not apparent in shake flasks . These findings are especially noteworthy because glycerol, glucose, ethanol and acetate have all been shown to support growth of P. pastoris cells without inducing the AOX promoter . For example, Hellwig and colleagues  demonstrated glycerol in the culture medium inhibited production of a recombinant single-chain antibody in mixed feed bioreactor cultures, while Inan and Meagher reported that ethanol and acetate repress AOX-driven expression . The first aim of our study was to specifically investigate the pre-induction phases of P. pastoris bioreactor cultivations producing recombinant hA2aR. We examined a glycosylation-deficient hA2aR mutant designed by Fraser , who had previously achieved a functional yield of 4 pmol mg-1 in shake flask cultures with no pre-induction activity. Prior to methanol induction, we detected baseline production of hA2aR confirming that expression driven by the AOX promoter is leaky in a glycerol-containing medium. In these cultures the baseline yield of hA2aR was not substantially improved in the methanol induction phase and pre-induction yields of hA2aR were maintained even at cytotoxic levels of methanol. In order to assess whether these observations were specific to hA2aR as the recombinant target protein, two additional strains were investigated; one that secretes the model protein, soluble green fluorescent protein (GFP) and one that secretes the peripheral membrane protein, human calcitonin gene-related peptide receptor component protein (as a fusion protein with GFP; hCGRP-RCP-GFP). When grown on glycerol or glucose as the pre-induction carbon source, GFP (as for hA2aR) was produced in the pre-induction phases. 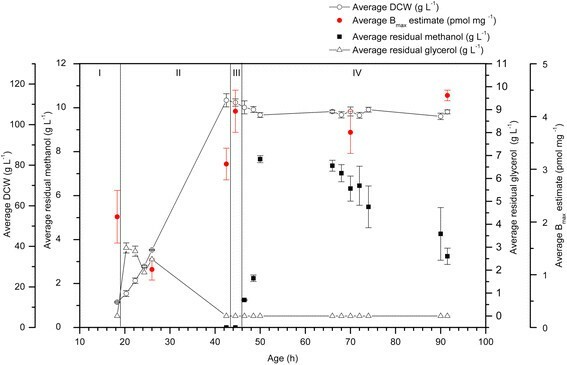 Following methanol induction, yields were not substantially improved for glycerol-grown cells, but were increased by a factor of 4 without a corresponding increase in biomass for glucose-grown cells. Pre-induction expression of hCGRP-RCP-GFP was detected in glycerol-grown cells. In contrast, there was no pre-induction expression in shake-flask cultures of strains producing GFP, horseradish peroxidase (HRP), the human tetraspanins hCD81 and CD82 or the tight-junction protein human claudin-1. These data demonstrate that bioreactor but not shake-flask cultivations exhibit recombinant protein production in both glycerol- and glucose-grown pre-induction phases. This highlights the importance of understanding the influence of pre-induction phase cultivation conditions on both recombinant protein yields and P. pastoris biomass yields. Duplicate 1 L bioreactor cultivations of P. pastoris producing a glycosylation-deficient hA2aR mutant  were examined over a 91 h cultivation period. Since it is established that lowering the temperature to 22°C during induction increases the functional yield of hA2aR ,,, the cultivation temperature was lowered during phase III. Figure 1 shows the glycerol batch (I), glycerol fed-batch (II), transition (III) and methanol induction (IV) phases analysed in this study together with the residual glycerol measurements, dry cell weight (DCW) and Bmax estimates for recombinant hA2aR binding activity, as measured by radio-ligand binding with the tritiated antagonist, ZM241385. Residual glycerol peaked during phase II at ~ 2 g L -1 and was not present during the transition and induction phases (III and IV). Binding activity between 1.1 and 3.1 pmol mg-1 was measured during the batch and fed-batch phases (I and II), indicating leaky expression. During the transition phase (III), binding activity increased to 4.1 pmol mg-1 and during the induction phase (IV) it was 3.7 – 4.4 pmol mg-1. The specific yield from the 1 L cultivation was 122.2 pmol g-1 and the total yield was 12,986.3 pmol. Notably, the impact of the methanol feed was minimal since the pre-induction specific yield was not substantially increased (Figure 1). hA 2a R binding activity is present in all phases of 1 L glycerol-grown P. pastoris bioreactor cultivations. Duplicate 1 L bioprocesses were analysed for hA2aR binding activity (pmol mg-1; red circles), DCW (g L-1; white circles), residual glycerol concentration (g L-1; white triangles) and residual methanol concentration (g L-1; black squares). hA2aR binding activity was measured in all the phases, including pre-induction phases I and II. The residual glycerol concentration was at its highest during phase II, dropping to zero in phase II and for the duration of the cultivation. DCW increased during phases I and II and plateaued during phases III and IV. Residual methanol ranged from 1.25 – 7.66 g L-1 during the induction phase. Measurements were made in triplicate for each culture. The error bars represent standard error of the mean (SEM). hA2aR was also produced in all phases of a completely methanol-free cultivation of glycerol-grown P. pastoris (Figure 2). During the fed-batch phase (II), when glycerol was present at 1.9 g L-1, the recombinant hA2aR yield was 1.1 pmol mg-1, reaching a final yield of 1.6 pmol mg-1 at the end of the cultivation. The specific yield from the 1 L cultivation was 90.3 pmol g-1 and the total yield was 5,598.3 pmol. This was lower than the yield achieved in the corresponding induced culture (Figure 1; 122.2 pmol g-1 and 12,986.3 pmol at the end of phase IV) indicating the positive impact of the methanol feed on total yield. The DCW reached a maximum of 62.0 g L-1 in contrast to that of 106.3 g L-1 for the corresponding induced culture (Figure 1). hA 2a R binding activity is present in all phases of 1 L methanol-free cultivations. Duplicate 1 L bioprocesses for the same strain cultured previously (Figure 1) were analysed for hA2aR binding activity (pmol mg-1; red circles), DCW (g; white circles) and residual glycerol concentration (g L-1; white triangles) in the absence of methanol induction. hA2aR binding activity was measured in all the phases: glycerol batch phase (I); glycerol fed-batch phase (II) and carbon source starvation phase (III). The residual glycerol concentration was at its highest during phase I, dropping to zero in phase II and for the duration of the cultivation. DCW increased during phases I and II and plateaued during phases III. Measurements were made in triplicate. The error bars represent the SEM. To examine whether these findings transferred to larger vessels, two simultaneous pilot scale bioreactor cultivations (10 L starting volume) of P. pastoris expressing hA2aR were compared following the same batch, fed-batch and transition feeding regimes (Table 1). During the induction phase, different methanol feed profiles were applied: a low methanol feed profile with methanol concentrations maintained below 5.0 g L-1 and a higher methanol feed profile with methanol concentrations allowed to exceed 5.0 g L-1. A total cultivation time of 91.2 h included the following phases: batch (phase I), fed-batch (phase II), transition (phases IIIA and IIIB) and induction (phase IV and V). An identically-conducted batch phase (I) on 10 g L-1 glycerol lasted for 19.1 h for both bioprocesses. At this point, the characteristic DO spike indicated full consumption of the glycerol carbon source and the stirrer speed decreased as a result of the DO control. In the subsequent 20 h fed-batch phase (II), the same exponential, growth rate-limiting glycerol feed profile of 4 g L-1 h-1 was applied to both bioprocesses, and increased exponentially at a rate of 0.15 h-1 for 10 h and then 0.03 h-1 until the end of this phase. The transition phase had two different sections (IIIA and IIIB): in phase IIIA, no feed was applied to the cultivations for 1 h; in phase IIIB a constant methanol feed of 4 g L-1 h-1 was applied. At the end of phase IIIB (47 h), the cultivation temperature was lowered to 22°C and then the induction phase commenced differently for the two cultivations. For both cultivations, methanol was added in an exponential manner. For the low methanol fed cultivation, a total of 2.2 kg of methanol was added and for the high methanol fed cultivation, a total of 3.8 kg methanol was added by the end of the cultivation. The total yield of hA2aR (pmol) and the specific yield of hA2aR per gram of DCW (pmol g-1) were derived from the Bmax and total membrane protein measurements, as described in the Methods section. Values are calculated per L of culture for the transition and induction phases of the low and high methanol cultivations and are the mean of triplicate determinations, with the standard error of the mean in parentheses. Triplicate measurements were from three different membrane preparations and standard error of the mean is shown in parentheses. Table 1 shows Bmax estimates, residual glycerol and methanol concentrations and the amount of biomass generated (DCW and total membrane protein) for both cultivations during the transition and induction phases. The low methanol cultivation produced the highest total and specific yields of hA2aR. Even in the absence of methanol, hA2aR binding activity was 4.4 pmol mg-1 for both the low (SEM = ± 0.1 pmol mg-1) and high methanol (SEM = ± 0.2 pmol mg-1) cultivations (Table 1). For the low methanol cultivation, in phase IIIB, where a constant methanol feed was initiated and glycerol was still present at 1.1 g L-1, functional receptor was detected. In phases IV and V of the low methanol cultivation, no glycerol was present and binding activity was present. For the high methanol cultivation during the transition and induction phases (IIIB and IV), glycerol was present in the culture medium and binding activities were 4.0 and 3.8 pmol mg-1, respectively. In phase V, there was no residual glycerol in the culture medium and binding activity was 3.1 pmol mg-1. In order to assess whether pre-induction expression was specific to hA2aR as the recombinant target protein, we examined the production of recombinant soluble GFP. Figure 3 shows the data for duplicate 1 L bioreactor cultivations with glycerol as the pre-induction carbon source. The residual glycerol concentration was at its highest during phase I, eventually dropping to zero in phase II: during the batch phase (I), glycerol was present at 3.0 g L-1 and the recombinant GFP yield was 2.6 mg L-1 prior to methanol addition. The GFP yield increased from 2.7 to 3.5 mg L -1 in the fed-batch phase (II; the glycerol was consumed 3 h into this fed-batch phase), reaching a final yield of 4.7 mg L-1 in the induction phase (IV). Residual methanol ranged from 3.01 to 8.52 g L-1 and DCW reached a maximum of 175 g L-1. Recombinant GFP is produced in the pre-induction phases of 1 L glycerol-grown P. pastoris bioreactor cultivations. GFP yield (mg L-1; green squares) was measured in the culture supernatant in all phases of duplicate 1 L glycerol-grown P. pastoris cultures. The residual glycerol concentration (g L-1; white triangles) was at its highest during phase I, eventually dropping to zero in phase II. The DCW (white circles) for this cultivation reached a maximum of 175 g L-1. Residual methanol (g L-1; black squares) ranged from 3.01 to 8.52 g L-1. All measurements were made in triplicate and error bars represent the SEM. While glycerol de-represses AOX expression, glucose has been shown to repress AOX expression  even in the presence of methanol . Duplicate cultivations were therefore analysed in which glucose replaced glycerol as the pre-induction carbon source in the recombinant production of both hA2aR (Figure 4) and GFP (Figure 5). For the production of hA2aR (Figure 4), the residual glucose concentration ranged from 0.01 to 0.04 mM; glucose was not fully consumed by the cells during the cultivation. However, when the residual glucose was very low during the fed-batch phase (phase II; 0.012 mM), the Bmax was 1.2 pmol mg-1 which was similar to Bmax values during methanol induction (phase IV; 1.17 to 1.46 pmol mg-1). The residual glucose also remained above zero during the transition phase (III, no glucose added). The hA2aR yield decreased between 26 and 46 hours (phase II and III) and then increased to 1.17 – 1.46 pmol mg-1 when methanol was added for the induction phase (IV). Methanol levels reached cytotoxic levels rapidly (99.76 g L-1) by the end of the cultivation which enabled us to confirm our earlier findings at pilot scale for glycerol-grown cultures (Table 1): we observed that for the glucose-grown cultures in Figure 4, pre-induction yields could be at least maintained after methanol induction, even in the presence of cytotoxic concentrations of methanol. The DCW reached a maximum of 21 g L-1 by the end of the cultivation. 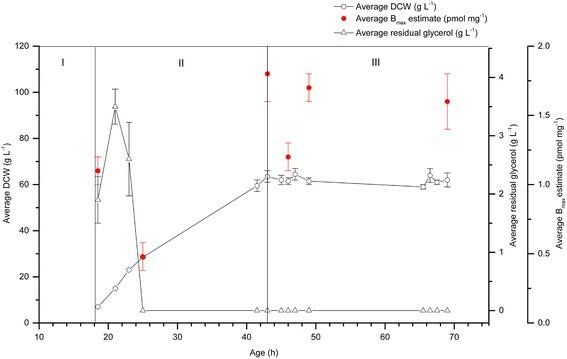 These results differed from the glycerol grown cells (Figure 1): the DCW weight produced by the glucose-grown cultivation was only 21 g L-1 when compared to greater than 100 g L-1 for the glycerol-grown cultivation. The hA2aR levels also differed: better yields were produced from the glycerol-grown cultivation (a maximum of 4.4 pmol mg-1 compared to a maximum of 1.46 pmol mg-1 at cytotoxic methanol levels, respectively). Recombinant hA 2a R is produced in the pre-induction phases of 1 L glucose-grown P. pastoris bioreactor cultivations. hA2aR binding activity (pmol mg-1; red circles) was measured in the culture supernatant in all the phases of a 1L glucose-grown P. pastoris cultivation. The residual glucose concentration (mM; white inverted triangles) ranged from 0.01-0.04 mM during the cultivation was not consumed completely by the cells. The residual methanol (g L-1; black squares) ranged from 0.20 to 99.76 g L-1. The DCW (g L-1; white circles) for this cultivation reached a maximum of 21 g L-1. All measurements were made in triplicate and error bars represent the SEM. Recombinant GFP is produced in the pre-induction phases of 1 L glucose-grown P. pastoris bioreactor cultivations. GFP yield (mg L-1; green squares) was measured in the culture supernatant in all phases of duplicate 1 L glucose-grown P. pastoris cultivations. The residual glucose concentration (mM; white inverted triangles) was at its highest during phase I, eventually dropping to zero in phase II. The residual methanol (g L-1; black squares) ranged from 2.83 to 8.69 g L-1. The DCW (g L-1; triangles) for this cultivation reached a maximum of 30 g L-1. All measurements were made in triplicate. The error bars represent the SEM. For the production of GFP (Figure 5), the residual glucose concentration was at its highest during phase I, eventually dropping to zero in phase II: during the batch phase (I), when the glucose concentration was 6 mM, the yield of recombinant GFP was 2.5 mg L-1 prior to methanol addition. This increased from 2.5 to 3.5 mg L-1 in the fed-batch phase (II; the glucose was consumed 3 h into this fed-batch phase), reached a plateau in the transition phase (III) and then increased during the induction phase (IV) to a maximum value of 13.6 mg L-1. The residual methanol concentration ranged from 2.83 to 8.69 g L-1 and the DCW reached a maximum of 30 g L-1. 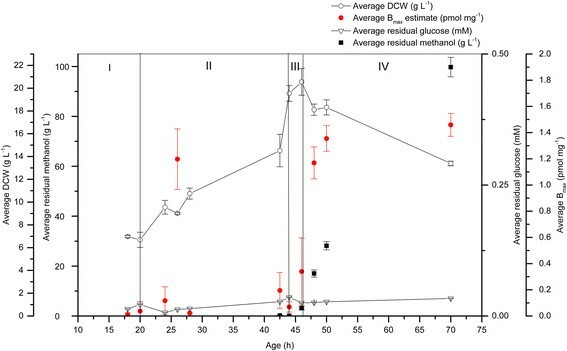 Once the pre-induction carbon source was depleted, DCW values for glycerol-grown cells (Figure 3) were approximately 5 times higher than for glucose-grown cells in the equivalent phase. However, glucose-grown cells exhibited a higher specific productivity than glycerol-grown cells, producing 3 times the yield of GFP at the expense of their biomass yields. Since GFP was present in the pre-induction phases of both glycerol- and glucose-grown P. pastoris bioreactor cultivations (Figures 3 and 5), its production was analyzed in the absence of a methanol induction step (Figure 6). GFP yield was measured in the culture supernatant in all phases of two 1 L P. pastoris cultivations, one grown on glycerol and one grown on glucose (Figure 6). In these cultivations, the transition phase (III) was extended from 2 h to 30 h. During the batch phase (I) of the glycerol-grown culture (Figure 6; upper graph), glycerol was present at 2.9 g L-1 and the recombinant GFP yield was 2.1 mg L-1 in line with the earlier glycerol-grown cultivations (2.6 mg L-1 prior to methanol addition, Figure 3). The total GFP yield remained stable in the fed-batch phase (II) and reached a final yield of 8.4 mg L-1 at the end of the cultivation. This was higher than the yield achieved in the corresponding induced cultures (4.7 mg L-1 at the end of phase IV; Figure 3) indicating the negative impact of the methanol feed on total yield. 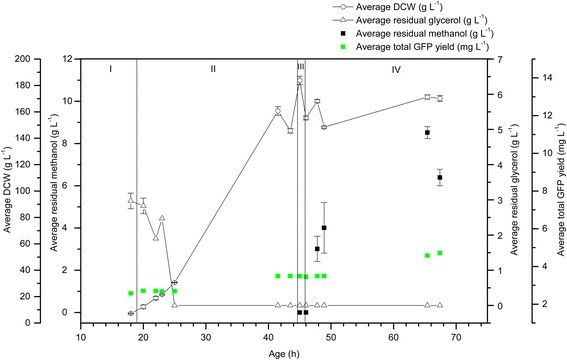 The DCW for the methanol free cultivation reached a maximum of 92.5 g L-1 (Figure 6; upper graph) in contrast to that of 175 g L-1 for the corresponding induced culture (Figure 3). Recombinant GFP is produced in methanol-free cultivations of P. pastoris grown on either glycerol or glucose as the sole carbon source. GFP yield (mg L-1; green squares) was measured in the culture supernatant in all phases of two 1 L P. pastoris cultivations, one grown on glycerol (upper graph) and one grown on glucose (lower graph). The residual glycerol concentration (upper graph; g L-1; white triangles) was at its highest during phase I, eventually dropping to zero in phase II. The DCW (upper graph; g L-1; white circles) for this cultivation reached a maximum of 92.5 g L-1. The residual glucose concentration (lower graph; mM; white inverted triangles) eventually dropped to zero in phase II. The DCW (lower graph; g L-1; white circles) for this cultivation reached a maximum of 46.5 g L-1. All measurements were made in triplicate the error bars represent the SEM. 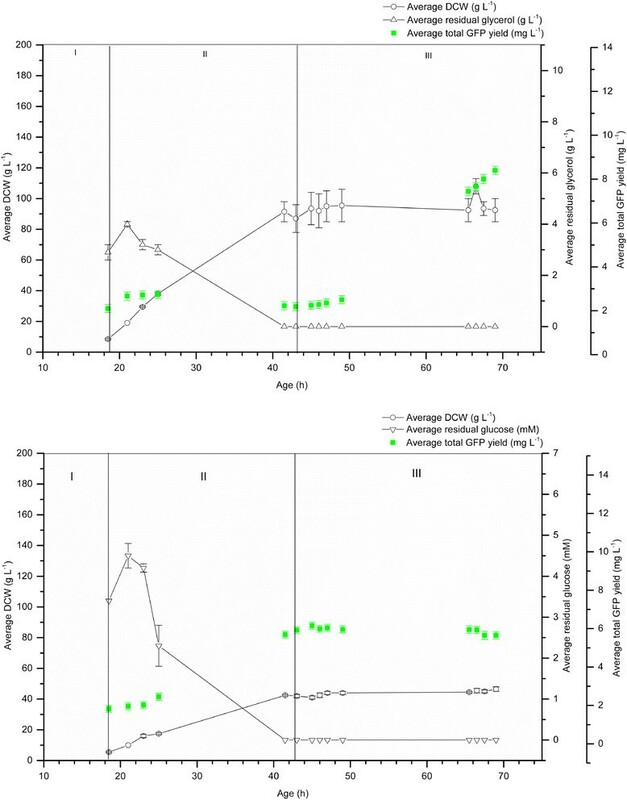 During the batch phase (I) of the glucose-grown culture (Figure 6; lower graph), glucose was present at 3.4 mM and the recombinant GFP yield was 1.8 mg L-1, which was lower than that for the earlier glucose-grown cultivation (2.5 mg L-1; Figure 3). The total GFP yield increased in the fed-batch phase (II), remained stable in the transition phase and reached a final yield of 5.6 mg L-1 at the end of the cultivation. This was lower than the yield achieved in the corresponding induced culture (13.6 mg L-1 at the end of phase IV; Figure 3) indicating the positive impact of the methanol feed on total yield. The DCW reached a maximum of 46.5 g L-1 in contrast to that of 30 g L-1 for the corresponding induced culture (Figure 5). To examine whether these findings were applicable to other target proteins, we examined the pre-induction phases of glycerol-grown bioreactor cultivations producing hCGRP-RCP-GFP : hCGRP-RCP-GFP was detected in the pre-induction phases (Table 2, Additional file 1). In contrast, shake-flask cultivations of GFP , HRP, hCD81 , hCD82  and human claudin-1  showed no recombinant protein production in the pre-induction phases (Table 2, Additional file 1). Pre-induction expression in glycerol-grown cells? Pre-induction expression in glucose-grown cells? The presence (Y) or absence (N) of recombinant protein was determined in bioreactor and shake-flask cultivations for glycerol- and glucose-grown cells as indicated; the evidence supporting these designations is given in parentheses and refers to figures within the text or in supplementary files; “–” indicates that the experiment was not done. It is established that both the concentration and rate of addition of methanol to P. pastoris cultures can substantially affect recombinant protein yields ,–. In contrast, the impact of the pre-induction phases of P. pastoris cultures on yield has not been examined systematically in either bioreactor or shake-flask formats. A significant finding emerging from this work is that an integral membrane protein (hA2aR), a soluble protein (GFP) and a peripheral membrane protein (hCGRP-RCP-GFP) are produced prior to induction with methanol in bioreactor cultivations of P. pastoris. This is consistent with a previous report by Singh and colleagues who noted pre-induction hA2aR binding activity in glycerol-grown bioreactor cultivations of P. pastoris, an observation that was not further elaborated upon . In a different bioreactor study by Çelik and colleagues, recombinant hEPO appeared to be produced prior to the onset of the methanol feed, but this was not discussed by the authors . In contrast, pre-induction hA2aR binding activity was not apparent in shake-flasks using complex medium in studies by Singh and colleagues  or by Fraser . In agreement with this, we show that GFP, HRP, hCD81, hCD82 and human claudin-1 are not detected in the pre-induction phases of shake-flask cultivations. The reason for this is currently unknown; we suspect it may be a function of the different oxygenation of cultures in the two formats and/or the different media used (complex in shake-flasks and minimal in bioreactors) . The demonstration of recombinant protein synthesis prior to induction is especially noteworthy because glycerol, glucose, ethanol and acetate have all been shown to support growth of P. pastoris cells without inducing the AOX promoter ; our systematic study demonstrates that recombinant hA2aR and GFP can be detected in both glycerol- and glucose-grown bioreactor cultivations prior to methanol induction, confirming earlier suggestions of leaky expression from AOX promoters. Our data therefore suggest that the productivity of AOX-dependent bioprocesses is not solely reliant on induction by methanol and that in order to maximize total yields, the impact on specific productivity of pre-induction phase cultivation should be optimized. Our data demonstrate that methanol induction does not necessarily increase the pre-induction specific yield, measured in the transition phase, for cells initially cultured on glycerol. The total yield of hA2aR was at least maintained once the methanol feed commenced during the induction phase (Figure 1, Table 1), but the increase in total yield was not substantial, being only approximately double that of the pre-induction yield (Figure 1, Table 1). A subsequent glycerol-grown P. pastoris cultivation also produced recombinant GFP in the pre-induction phases, with similar results following induction with methanol (Figure 3). These increases in yield are similar to those seen by Çelik and colleagues in their hEPO cultivations . Pre-induction hA2aR yields were maintained even under cytotoxic methanol concentrations (Table 1 and Figure 4). Cunha and colleagues  and Schenk and colleagues  demonstrated that residual methanol concentrations between 2 g L-1 and 3.5 g L-1 were optimal for soluble protein production, while methanol concentrations between 3.7 g L-1 and 20 g L-1 were cytotoxic and inhibited growth ,, consistent with our findings. We previously reported that residual methanol levels below 2.98 g L-1 gave optimal yields of recombinant GFP (3.74 g) when following a mixed 60% methanol and 40% sorbitol induction regime. In contrast, a 100% methanol induction regime, where the residual methanol reached a maximum level of 182.25 g L-1, gave a poor recombinant GFP yield (0.09 g) . Previously, we have demonstrated that high yields of recombinant GFP (3.74 g) but low biomass yields (OD595 = 64) were produced when P. pastoris was grown at a low induction phase growth rate (μ = 0.006 h -1). In contrast, a higher induction phase growth rate (μ = 0.015 h -1) resulted in a higher biomass yield (OD595 = 74), but a lower total GFP yield (0.98 g) . ÇalÇk and colleagues  applied three different growth rates in the methanol induction phase of P. pastoris cultures expressing soluble human growth hormone: 0.02, 0.03 and 0.04 h -1 using a mixed sorbitol and methanol feed. The highest biomass yield (48 g L-1) was obtained at a growth rate of 0.04 h -1, but the highest yield of recombinant human growth hormone (270 mg L-1) was produced at 0.03 h -1. The authors suggested that this might be due to the lower growth rate producing lower biomass and therefore fewer extracellular proteases being present in the cultivation. Similar trends were also observed for GFP, hEPO, human serum albumin, heavy-chain fragment C of Botulinum neurotoxin serotype A and avidin ,,,. Glucose has previously been shown to support growth of P. pastoris, but at a lower specific growth rate and yielding lower amounts of biomass than that achieved by cells grown on glycerol . Following induction with methanol, DCW values for glycerol-grown cells producing GFP were approximately 5 times higher than for glucose-grown cells in the equivalent pre-induction phase (Figures 3 and 5), although the glucose-grown cells produced 3 times the GFP yield of the glycerol-grown cells (Figures 3 and 5). Notably, the methanol feed had a positive impact on yield for glucose-grown cells, but a negative impact on yield for glycerol-grown cells (Figures 3, 5 and 6). 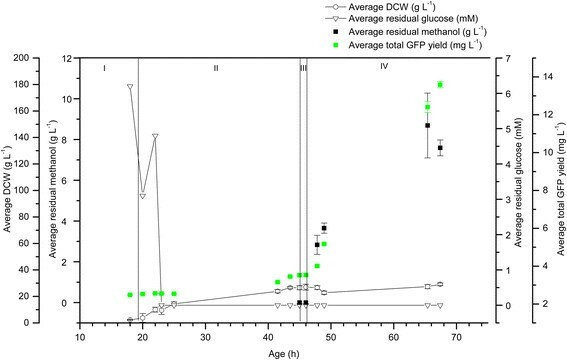 For hA2aR produced in glucose-grown cultures (Figure 4), methanol also had a positive impact on yield. However, the yields compared to the glycerol-grown cells were lower, which was in contrast to GFP yields produced in glucose-grown cells. At pilot scale, the methanol feed influenced the biomass yield and particularly increased the total hA2aR yield in the low methanol cultivation compared to the high methanol cultivation (Table 1). Notably, a similar increase in total membrane protein yield has previously been reported to increase total volumetric yields of GPCRs in a respiratory yeast strain of Saccharomyces cerevisiae. As a consequence of increased total membrane protein yield, the yield per unit volume of the low methanol cultivation was approximately 40 times higher than shake flask cultivations of the same hA2aR construct ; total membrane protein yields from shake flasks are 200 mg  compared with almost 8,000 mg in bioreactors (Table 1). This yield improvement compares very favourably with that achieved by Singh and colleagues using an optimized hA2aR construct under broadly similar bioprocess conditions to our study : on transferring from shake flasks to bioreactors a yield improvement of approximately 25 times was achieved on account of both an increase in specific productivity (25 pmol mg-1 in a shake flask; 100 pmol mg-1 in a bioreactor) and biomass yield (OD600 = 13 in a shake flask; OD600 = 80 in a bioreactor). Overall, our data suggest that specific productivity may not necessarily be solely dependent on methanol induction and can be increased at the expense of improvements in biomass yields in the methanol induction phase. Production of hA2aR, GFP and hCGRP-RCP-GFP was detected in bioreactors prior to methanol induction in glycerol- and glucose-grown cells; in contrast, GFP, HRP, hCD81, hCD82 and human claudin-1 were not detected in the pre-induction phases of shake-flask cultivations. In bioreactors, the transition phase yield was not necessarily increased following methanol induction and was maintained even at cytotoxic methanol concentrations. Using glucose as a pre-induction carbon source, specific productivity could be increased at the expense of improvements in biomass yield, with methanol having a positive impact on these cells. These data provide a platform to further optimize the production of recombinant proteins, and especially GPCRs  as part of modern drug discovery programmes. P. pastoris strains X33 hA2aR , X33 GFP ,, SMD1163 hCGRP-RCP-GFP , CBS 7435 Muts HRP, X33 hCD81 , X33 hCD82  and X33 human claudin-1  were used in all experimental procedures using previously-described culture conditions. To generate a seed culture for the bioreactor studies or to establish a shake-flask culture, a single, freshly-streaked colony was used to inoculate 5 mL YPD medium (2%C peptone, 1%C yeast extract, 2%C glucose), and this was incubated at 30°C in a shaking incubator for 2 days. The 5 mL YPD pre-culture was then used to inoculate 50 mL YPD in a 250 mL baffled shake-flask, and this was incubated at 30°C in a shaking incubator overnight to an OD600 of 15. For bioreactor cultivations, these cells were then used to inoculate 200 mL FM22 minimal medium, which was composed of (g L-1) KH2PO4, 42.9; (NH4)2SO4, 5; CaSO4.2H2O, 1.0; K2SO4, 14.3; MgSO4.7H2O, 11.7; and glycerol, 10 with Pichia trace minerals 4 (PTM4) salt solution composed of (g L-1) CuSO4.5H2O, 2.0; NaI,0.08; MnSO4.H2O, 3.0; Na2MoO4.2H2O, 0.2; H3BO3, 0.02; CaSO4.2H2O, 0.5; CoCl2, 0.5; ZnCl2, 7; FeSO4.7H2O, 22; biotin, 0.2; 1 ml of concentrated H2SO4 . These bioreactor seeder flasks were incubated at 30°C and 220 rpm over-night to an OD600 of 30. For the glycerol cultivations, 1 L FM22 medium supplemented with 0.5 mL J673A (Struktol), 4 mL PTM4 salts, 0.8 mL 10 g L-1 biotin and 10 g 100% glycerol was transferred to a 2 L (total volume) jacketed glass bioreactor (Applikon Biotechnology Ltd). Culture temperature was maintained at 30°C and pH at 5. The maximum agitation rate was 1,250 rpm. The air flow rate was 2 L min-1 and the DO set point was 30%. The end of the glycerol batch phase was indicated by a spike in DO to 100%. A glycerol (50% v/v aqueous glycerol) fed-batch phase was maintained for 40 h at a flow rate of 14 mL min-1. For the methanol induced cultivations, the transition phase was maintained for 2 h and the temperature was lowered to 22°C for cultivations producing hA2aR but remained at 30°C for the GFP cultivations. The induction phase comprised feeding 50% (v/v) aqueous methanol at 2.04 mL min-1 for 40 h. For the glucose cultivations, 1 L FM22 medium supplemented with 0.5 mL J673A (Struktol), 4 mL PTM4 salts, 0.8 mL 10 g L-1 biotin and 10% glucose was transferred to a 2 L (total volume) jacketed glass bioreactor (Applikon Biotechnology Ltd). Culture temperature was maintained at 30°C and pH at 5. The maximum agitation rate was 1,250 rpm. The end of the glucose batch phase was indicated by a spike in DO to 100%. A glucose (10%) fed-batch phase was maintained for 40 h at a flow rate of 14 mL min-1. For the methanol-free cultivations, the conditions remained the same as in the methanol induced cultivations for the batch and fed-batch phases. At the transition phase, the glycerol or glucose feed was stopped, the temperatures changed (22°C for the hA2aR cultivation and 30°C for the GFP cultivation) and the cultivations were allowed to run for a further 26 h without any methanol feed or any other carbon source. Bioreactor control was via an Applikon ADI1010 control unit. 10 L FM22 medium supplemented with 1 mL P2000 (Sigma-Aldrich), 40 mL PTM4 salts and 8 mL 10 g L-1 biotin were transferred into each of two 30 L (total volume) jacketed steel bioreactors (Biostat C, Sartorius Ltd). Culture temperature was maintained at 30°C and pH at 5. The maximum agitation rate was 1,500 rpm. For both cultivations, the end of the glycerol batch phase (phase I) was indicated by a spike in DO to 100%. A glycerol fed-batch phase (phase II) was then maintained for 40 h by employing an exponential feed rate of 50% aqueous glycerol (v/v) at 4 g L-1 h-1 increasing exponentially first at a rate of 0.15 h-1 for 10 h and subsequently at a rate of 0.03 h-1. The first section of the transition phase (phase IIIA; starvation), during which no further carbon source was fed into the bioreactor, was maintained for 1 h. The second section of the transition phase (phase IIIB) comprised a further 1 h, where a constant methanol feedstock (50% (v/v) aqueous methanol) was applied at 8 g L-1 h -1. The culture temperature was lowered to 22°C and an exponential methanol (50% (v/v) aqueous methanol) feed profile was applied by exponentially increasing the feed rate at 0.01 h-1 (low methanol cultivation) or 0.03 h-1 (high methanol cultivation). The induction phase continued for 40 h.
Samples (1 mL) were taken for optical density measurements at 600 nm (OD600). For dry cell weight measurements, 1.5 mL culture was sampled in triplicate, placed in pre-weighed tubes and centrifuged at 5,000 x g for 5 min. The supernatant was removed and stored at -20°C for residual glycerol and/or residual methanol analysis and the tubes were placed in a 100°C oven with the lids open and dried overnight. The dried tubes were moved to a desiccator for 2-3 days and then weighed on a microbalance. The dry cell weights were reported as g L -1 (g DCW per L of culture). Residual glycerol in the culture supernatants was analysed spectroscopically at 340 nm using a glycerol quantitation kit (r-biopharm, Roche) according to the manufacturer’s protocol. Triplicate determinations were performed for each sample. Residual glucose in the culture supernatants was analysed using an Accu-Chek Active Glucose analyser (Roche Diagnostics) or by Amplex® Red Glucose/Glucose Oxidase Assay Kit (Life Technologies) according to the manufacturer’s protocol. Triplicate determinations were performed for each sample. Residual methanol in the culture supernatants was analysed using a Thermo Scientific FOCUS Gas Chromatograph. Appropriately-diluted culture supernatants (1 μL) were injected in duplicate and the methanol peaks integrated using QuanLab® software. The mean value of the integrated peak area was used to estimate the residual methanol within the sample by comparison with methanol standards. Triplicate determinations were performed for each sample. Harvested cells producing recombinant hA2aR, hCD81, hCD82 or human claudin-1 were re-suspended in 2 mL breaking buffer (50 mM Na2HPO4, 2 mM EDTA, 100 mM NaCl, 5% glycerol w/v, pH 7.4) per gram of wet cell weight and disrupted at 30,000 psi for 20 min using an Avestin® C3 pressure homogeniser. Breaking efficiency was typically > 90% as determined by light microscopy. The samples were clarified by centrifugation at 10,000 x g, 4°C for 30 min and total membranes recovered from the supernatant at 100,000 x g, 4°C for 1 h. Total membranes were re-suspended in 10 mL Buffer A (20 mM HEPES, 50 mM NaCl, 10% glycerol, pH 7.0) per gram of total membrane. Protein concentration was determined using a BCA assay (Sigma-Aldrich) using BSA as a protein standard. 0.5 mL aliquots of membrane fraction were stored at −80°C prior to further analysis. Analysis by immunoblot was done as described previously . Membrane bound hA2aR was analysed using a single-point saturation radio-ligand binding assay. Membranes (0.5 mg mL-1) supplemented with 0.1 U of adenosine deaminase (Sigma-Aldrich) were incubated with 10 nM [3H]-ZM241385 (American Radiolabelled Chemicals UK Ltd) for 1.5 h at 30°C. 10 nM of [3H]-ZM241385 is expected to saturate the receptor . To assay non-specific binding, 1 μM ZM241385 (Tocris) was added to the incubations. Assays were terminated by centrifugation at 14,000 rpm in a bench-top centrifuge for 5 min at 4°C. The supernatant was discarded and the pellets were washed with water and then solublilised with Soluene® (PerkinElmer) overnight. Solubilised pellets were added to scintillation fluid and counted in a scintillation counter (Packard 1600TR Liquid Scintillation Analyser) to determine the amount of bound radio-ligand. Triplicate determinations were performed for each sample. Bmax values were calculated from the Langmuir occupancy equation and reported as pmol hA2aR per mg of total membrane protein , as determined by BCA assay. Supernatants (100 μL) from cultures secreting GFP were assayed for GFP fluorescence using a Spectramax Gemini XS® plate reader with an excitation wavelength (λexe) of 397 nm and emission wavelength (λem) of 506 nm at 25°CC. Triplicate determinations were performed for each sample. All samples and blanks were buffered to pH >7.0 using 50 μL 1 M potassium phosphate pH 8.0. To determine the concentration of GFP in each of the samples, a recombinant GFP standard (Vector Laboratories Ltd) was used to construct a standard curve relating GFP fluorescence to protein concentration, as previously described . Recombinant CGRP-RCP-GFP was analysed from culture supernatants by immunoblot as described previously . Supernatants (25 μL) from cultures secreting HRP were assayed for HRP using a 2 Component ABTS Peroxidase Substrate system (Kirkegaard Perry Laboratories) containing ABTS [2,2′-azino-di-(3-ethylbenzthiazoline-6-sulfonate)] substrate and hydrogen peroxide. This liquid substrate system produces a blue-green coloured product when reacted with peroxidase present in the test samples. 25 μl of culture supernatant was mixed with 150 μl of ABTS-H2O2 in a 96 well plate and the increase in absorbance of the end product (after 10 minutes of incubation at room temperature) was read at 405 nm using a spectrophotometer (Multiskan GO, Thermo Scientific). To determine the concentration of HRP in each of the samples, a purified HRP standard (Sigma-Aldrich) was used to generate a standard curve relating peroxidase activity to protein concentration. Graphs were constructed using OriginPro 9.1® software. This work was supported by a BBSRC CASE studentship with AstraZeneca Ltd to RMB supporting ZB and by BBSRC grant BB/I019960/1 to DRP and RMB supporting SJR. The hCGRP-RCP cDNA was cloned and the antibody raised with support from NIH grant DK52328 to ID. We thank Jiteen Ahmed and Victoria Ewart for their invaluable help with the gas chromatography experiments and Aston Research Centre for Healthy Ageing (ARCHA) for support. ZB was involved in all aspects of the experimental design, data collection, data analysis and interpretation and was supported by RMB and MG. DRP supported the execution and analysis of the radio-ligand binding assays. SJR supported the execution and analysis of the hA2aR-, GFP- and hCGRP-RCP-GFP -producing cultivations. MJ, MC and DS produced data for HRP, hCD81, hCD82 and human claudin-1. ID provided hCGRP-RCP-GFP cDNA and the anti- hCGRP-RCP antibody. RMB directed the study, coordinated the data analysis and interpretation and, together with ZB, drafted the manuscript. All authors contributed to, read and approved the final version of the manuscript.